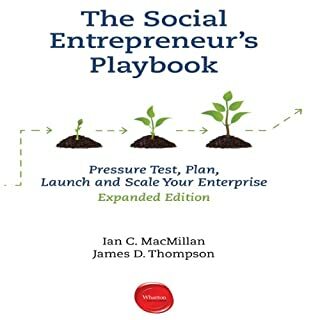 Available for the First Time: The Complete Social Entrepreneur’s Playbook by Wharton professor Ian C. MacMillan and Dr. James Thompson, director of the Wharton Social Entrepreneurship Program, provide a tough-love approach that significantly increases the likelihood of a successful social enterprise launch in the face of the high-uncertainty conditions typically encountered by social entrepreneurs. Just finished this book and learned a lot but I think it would be nicer to have a hard copy because there are lots of lists and frameworks that would be helpful to refer back to and see drawn out. Tough to do with time stamps and such in audio format.